Below are a selection of some of the nice things that people have said about us. 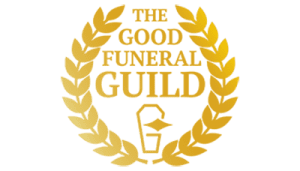 You can read more reviews on The Good Funeral Guide. Natural Endings was recognised as Green Funeral Director of the Year by The Good Funeral Guide (2013). We chose Natural Endings because we wanted our Mum to be taken care of by a female funeral director and we wanted a coffin made of natural materials. We chose the cream wool coffin and if you can say a coffin looks beautiful, it did, with a posy of English flowers on top. Rosie and her pall bearers were professional, elegant and supportive on the day of the funeral. The men were gentle giants.They were all so sensitive with us and with our Mum. Supporting us as a family to carry our Mum in and out of church holding the coffin by the side handles.The price of the funeral was extremely reasonable and we were given all the costs up front, no hidden or added on costs. 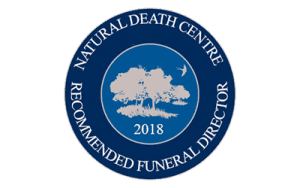 HIGHLY recommended by the Natural Death Centre! We have received many letters from families who could not speak more positively about the service received by Natural Endings Funeral Services. “Everything on the day was perfect and I cannot thank you enough for your professionalism and the way that you handled everything. Many of the people commented that it was the best funeral they had ever attended – thank you so much. “On behalf of all my family I would like to thank you for all your help, kindness and patience. “Thank you. Mum’s funeral was just how she would have wanted it to be. Many people have said how beautiful it was. “From my first phone call to Natural Endings we felt well informed, and after further contact you were very accommodating to all members of the family and their wants and needs. If you have had a bereavement and would like to talk to someone about funeral arrangements please telephone our 24 hour number 0161 969 6690. Or email using our Enquiry form.